This entry was posted in Australian history, Historians. Bookmark the permalink. What a find! Thankyou very much for this and for the background on these volumes which you have provided. This is on my list of things to check out this week. Sounds like a massive task and well worthwhile. I can imagine every historian in the nation will be grateful. c] Series IV .. features documents relating to the legal system. 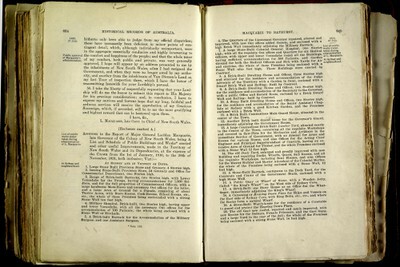 Did every state agree to send a copy of its documents to Sydney, in the decades before Federation? If not, how do the Historical Records of Australia cover the other states and territories? I’ve added to the post, as you can see. The states had mainly commissioned their own collection by Bonwick, and then these were incorporated (largely without attribution) into HRA. It’s hard to tell, because Watson doesn’t include details about where the sources are located. Series III is the one that has the most information about the other states- especially Tasmania and Port Phillip. It goes up to 1830 and I’m not sure if it includes the Swan River Colony in WA or not. But overall, it’s very NSW-focussed. Thank you for this information! What a resource. Volume 10 of Series III appeared in 2013. All of Series I, Series III (volumes 1-6) and the Historical Records of New South Wales are available from Gould Genealogy either as single volumes or, more cost effectively, as single DVDs–often on sale so good value. Thank you- I didn’t know that Volume 10 had appeared.